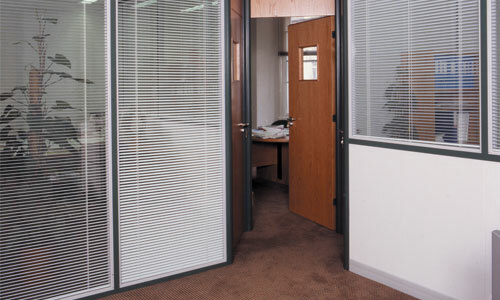 The Finesse Fire and Sound office partitioning system provides the foundation for the Finesse and Crystal family of demountable, high-quality, robust and attractive office partitioning systems. The Finesse Fire and Sound office partitioning system provides the foundation for the Finesse and Crystal family of demountable, high-quality, robust and attractive office partitioning systems. Many of the carefully developed parts are shared between the Finesse Fire and Sound system, the Crystal Double Glazed system and the Crystal Single Glazed system. This unique design feature provides the office planner with total flexibility in layout options, enabling elevation changes from fire-rated or single glazed to full-height drywall or double glazed, in any order, at any location. Fire and Sound Finesse FS is a certified fire-rated system achieving 60 certification with a full height drywall arrangement and 30 minutes with either full-height or partition height glazing. Finesse is certified to achieve a sound reduction of up to dB 45 with full-height 15mm thick boards with Rockwool infill or 43Db using 12.5mm boards with Rockwool infill. Full details for fire and sound ratings on this system are available. Please download our brochure here.